After weeks of waiting and a thousand votes, Salty Ink’s Chad Pelley has announced the winner of the Judge a Book By Its Cover contest, out of a shortlist of three Atlantic Canadian books released in 2009. 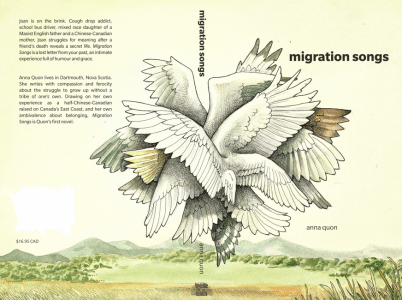 And the winner is (drumroll please): Anna Quon’s Migration Songs (Invisible Publishing), with design by Megan Fildes and artwork by Sydney Smith. Tying into the design of the book, there are some well-worded bird analogies or metaphors woven throughout the whole novel, which allude to their sense of community or rituals that [protagonist] Joan doesn’t have. How she chooses to see and depict birds, at any given moment in the novel “ trapped within a tree or flying free “ seems to be a reflection of how she feels in that moment. Joan spends a great deal of time in some sort of fond jealousy of birds. Migration Songs beat out The Factory Voice by Jeanette Lynes and chick-lit mystery Hit & Mrs. by Leslie Crewe.